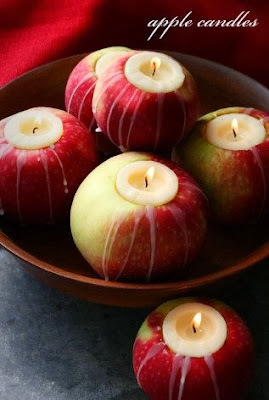 We absolutely love this photo we found on Pinterest of apples used as tealight holders for your fall candle display. How economical and easy! Simple carve out the top of an apple to make room for a tealight candle. Insert the tealight into the top of the apple and light. Voila! An attractive centerpiece perfect for the season. What's your favorite fall candle display?